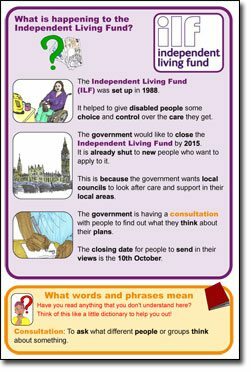 There was only a day left to submit responses to the government’s consultation on the future of the Independent Living Fund before the deadline of 10th October.However there are problems with the DWP IT technology so according to the ILF website the consultation period has been extended 2 days until October 12th. Get your MP to sign the EDM against Atos-add to the Outcry! Possibility for local DPACs and others…..
1. The issue of how we support and enable citizens with independent living /social care needs is one of the key domestic issues of the 21 century. As such we call on all political parties to give this issue the attention and urgency it deserves. b)Each locality to have a user led organisation modelled on Centres for Independent Living. c)Supporting independent living work towards a new approach that delivers support, equipment and/or adaptations according to need. d)More coherent and explicit standards to be developed bringing legislation and other rights into a coherent framework for improving the life chances of disabled people. e)The need to identify the benefits of delivering Independent Living to wider society including the economic case for investment in Independent Living support. 3.Adequate funding, from general taxation and national insurance contributions should be allocated and ring fenced for independent living / social care support. This funding must be recognised as key to upholding the rights of disabled peoples’ inclusion. Support for disabled people should be free at the point of delivery. 5. The ILF model helps the government meet its obligations to uphold disabled people’s rights under UNCRDP especially the obligations under article 19. 7.DPAC calls for this current flawed and inaccessible consultation on the ILF to be halted and the government instead to set up an independent ILF task force made of ILF users, ILF themselves with significant representation from disabled peoples organisations. The task force must be operated independently of the ODI, DWP with a resourced remit to carry out needs led review of ILF within the wider framework of independent living and social care support. 8.DPAC will only support changes to the current system which benefit disabled people’s right to live independently such as changes to the ILF trust dead, extension of ILF to new applicants, and the removal of charging for support from the Extension Fund. DPAC will continue to highlight the negative aspects of DILNOT recommendations. a) enables disabled people with the highest support needs to have real choice and control over their lives and in doing so contribute to, and take part in, society. 11. The ILF is a proven and cost effective mechanism for providing support to disabled people with the highest support needs. It has running and overheads costs of just 2% compared to 16% for L.A. social care services. f) a national eligibility criteria that is the basis for a consistent and equitable service. a) L.A’s will have little choice but to limit social care support to those with critical needs thereby denying the vast majority of disabled people the support they need to maintain decent, healthy and active lives. b) Local Authorities are increasingly focussed upon essential basic care, not upon full independent living for their service users. Care is, often confined to meeting only critical needs, other than when engaged in a joint package with the ILF. So for disabled people with high support needs , ring fenced funding, external leverage and a dedicated programme are needed, which is impossible to operate within Local Authorities. 14. The vast majority of disabled people who get ILF support are likely to see their support packages dramatically cut on transfer to the L.A resulting in less choice and control than they currently experience. 15. It will also mean an increase in non-voluntarily moves to residential care with all the attendant risks of abuse, neglect and removal of rights that this entails. Many disabled people will then be at further risk as they attempt to remain at home with inadequate support. 16. The transformation of L.A social care into a system of personalised support cited by the government as a key justification for transferring functions to L.A’s is simply not the experience of disabled people accessing or trying to access L.A social care support. a) L.A social care services are increasingly operating first and foremost as gate keeping systems that seek at all stages to ration and limit access to social care. This is further exacerbated by the postcode lottery. b) access to social care is increasingly only given to meet very basic personal care needs and these needs are met by increasingly prescribed and rationed services, for example the now notorious 15 minute ‘home care’ visits, that are removing all choice and control from disabled people. c) that the aims and outcomes envisaged by the development and piloting of personal budgets have simply not been achieved . Around 47% of disabled and older people are still without a personal budget and while numbers recorded by LAs to be on personal budgets grows, numbers in receipt of Direct Payments has stalled. The freedoms envisaged by personal budgets have not materialised. L.A’s have in the main retained the control (and the 16% overhead costs) that were meant to be transferred to the disabled person. d) The investment in local user led disabled people’s organisations (DPOs) which were seen as a key mechanism for delivering personalised support, has not taken place. Funding for DPOs and independent Direct Payment and personal budget support has been disproportionately cut. Research by Inclusion London in 2011 found that 1 in 5 DDPOs in London expected to close by end of 2013.
e) Current government proposals are completely unacceptable. Without any replacement or additional funding to maintain the support packages of disabled people currently supported by the ILF the vast majority of ILF users will be stripped of their basic rights, independence, quality of life and dignity, forced to either go into residential care or go without essential support . This spectre is causing untold stress and anxiety to ILF users. f)DPAC condemns the failure of this government to commit or explain in the current consultation how it intends to secure to fund the cost of ILF support packages after the planned closure of ILF in April 2015. 19.The State must act to ensure that disabled people with complex and high support needs are supported to live independent lives. 20. The ILF could provide much needed independent living expertise to disabled people and social care practitioners as well as national criteria to improve consistency of take up of independent living support. 21.The ILF should be expanded into a model for a national, strategic centre of excellence for independent living based on the needs, interests and human rights of disabled people and delivering independent living support to disabled people of all ages and all impairments. f) combines national consistency with support for local innovation. j) Taking account of the costs which disabled parents face if their children are in further or higher education, and assessment of capital should make adequate disregard of savings for this purpose. Based on World Bank figure for 2011 UK GDP of 1,495,567,800,000.
on Friday October the 12th 2012, we’re going to broadcast BBC Radio 5 Live’s Shelagh Fogarty Show from a venue in Sheffield from 12 – 2pm. The focus of the is how the coalition has performed so far and I am inviting an audience of people looking to question the Deputy Prime Minister of the issues that matter to them. You would need to be able to make your way to our venue in Sheffield city centre by 10.30am in order for everyone to be seated and for us to do various warm ups and rehearsals before we go live on air, and the event would finish by 2pm at the latest. We are particularly interested in hearing strong personal stories of people who have been affected by the changes to the benefit system. If anyone is interested could you pass on their number so I can have a brief chat? if anyone can go please ask to be in the audience. On Monday 8th October Victoria will be holding an audience debate in Birmingham covering the Conference. If you would like the opportunity to come and put your views forward or simply listen to the live debate please contact us on 01299 829299 as soon as possible or by email to alisonpedley@btinternet.com withyour name and telephone number and we will call you. Doors open at 8 a.m. to be seated by 9 a.m. the programme starts at 10.00 a.m. finishing at 12 noon. Please circulate to anyone that you think might be interested in taking part.